Massive respect to every1 involved! Alas, on account of all the press persons being nicked this story needs to be got out as much as possible! Not that much out there at the moment. Please help getting the story out if you can! My latest update is that absolutely every1 involved has been nicked up to about 17/18 people all told I reckon, including drivers, legal observers, etc. Vehicles believed to have also been impounded. 😦 A second wave lock-on with more heavy duty gear believed to have attached themselves to track shortly after 1st wave cleared; all arrested later that aft/eve. Lets get this story out there. Bristol and Bath Rising Tide Stop Coal Train – Happening Now ! Today, people involved in the Rising Tide Network1 have literally puts their necks on the line by chaining themselves to the rails in order to block the rail link to the Ffoss y Fran Open Cast Coal mine near Merthyr Tydfil. 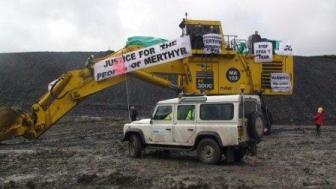 They are currently blocking the movement of coal trains from the mine to Aberthaw Power Station2. The process by which Miller-Argent3 were able to get the go ahead to exploit this resource at the social cost of both the local and global community, highlighting the democratic deficit in the planning process, which takes in to consideration the social-environmental impact of such projects. The newly formed quango “The Planning Commission” will only make these things worse, being able to ignore any consideration in favour of profit. Miller Argent have been quick to pressure their small workforce into mobilising against local concerns – but their apparent concern for their workers is betrayed by the fact that they are actually looking to sell the mine as the quantity of high quality coal is only about as half as good as they initially believed. They are in fact making a loss on the project. 2.Aberthaw Power Station is the biggest polluter in Wales. In 2006 it released 7.4. million tonnes of Co2. It is Projected to run until 2025 with NO PLANS to fit carbon capture storage (CCS) technology. 40% of the coal for the power station is supplied by Ffos y Fran. It was targeted by Bristol & Cardiff Rising Tide in 2008. 3.Miller Argent own and run Ffos Y fran. Argent are in turn owned by the BT Pensions Group. Both of these organisations make much of their ethical and sustainable practices But in this case they seem to be placing profits over and above any element of social responsibility. 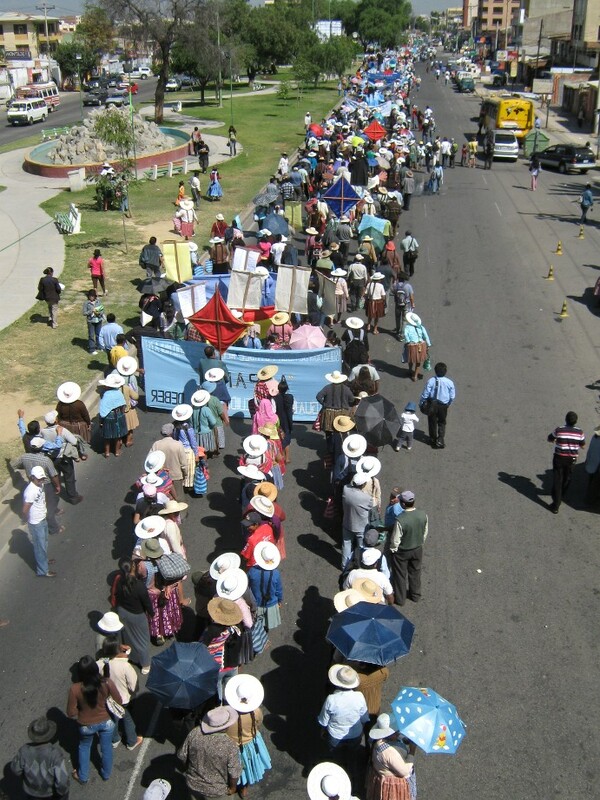 Several Excellent Reports have already been posted by westsiders/bristol no borderers attending the Earth Summit in Cochabamba called by Bolvian President Evo Morales. There blog “ayya” can be found here. They report on a immigration raid and the ‘co-opting’ of grassroots campaigns by the government , also report on local solutions to among other things sewage and composting and a commeration of 10 years of struggle for water rights. Meanwhile, in La Paz, Bolivia a government spokesman said that ‘Indian’ protesters set fire to the offices of a Japanese mining subsidiary to demonstrate against unwanted development and theft of water from the local populace. Activists from Bristol and Bath Rising Tide visited the Shell garage in Muller Road, Eastville at 8.30am this morning to highlight the repression experienced by communities in County Mayo, Ireland who are trying to stop Shell building an onshore high pressure pipeline and gas refinery.